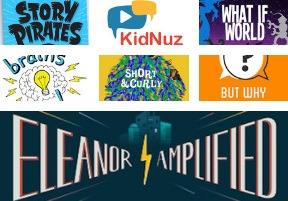 If you're a podcast junkie and want to introduce podcasts to your nieces and nephews but don't know where to start, we recommend these seven podcasts designed just for kids. Actors, comedians, improvisers, and musicians come together to perform stories written by kids. Story Pirates play dynamic characters and sing catchy songs kids will love and crave more of. Aunties and kids alike can enjoy listening to these exciting stories. For some extra fun, help your nieces and nephews think of a story to submit to Story Pirates- how cool would it be to have your story featured on their podcast! Have you ever wondered “What if popcorn and Hotwheels came to life?” Or “What if French fries and drinks had war?” What If World is full of funny “What If” questions asked by kids that are turned into wacky stories kids will love! Enchanting story-telling and silly voices keep kids captivated and on the edge of their seats. Kids will love this podcast because of its random story topics and creative presentation of each story. Each episode of KiDNuZ features a five-minute brush-up on current events, entertainment, news, politics, and sports. Each newscast is delivered like a real newscast, and full of age appropriate stories. There’s a short quiz at the end, so kids will be focused throughout the episode. These short, spit-fire updates will keep kids up to date on worldly topics and leave them wanting more. Brains On! is a podcast made especially for the little Albert Einstein in your life. These episodes are co-hosted by kids and based on a range of questions sent in by listeners. Brains On! will keep kids tuning in because they make learning new things fun because the podcast discusses topics that may not be covered in a classroom or are taught differently than how they would in school– like how spiders and ants climb walls, how we make sound, and how airplanes fly. Australian podcast Short and Curly talks about ethical dilemmas big and small. Short and Curly gets the conversation started about discussions that could be difficult to have on your own with your nieces and nephews, like whether or not children should have been saved first on the Titanic, is it ever okay to lie, or if their classroom is fair. The lighter questions leave kids thinking about something they hadn’t thought about before, like why children can’t vote, if pugs should exist, and if you can trust a robot. Short and Curly keeps listeners on their toes and excited about the next episode. But Why tackles questions submitted by kids about interesting topics like why spiders don’t stick to their webs, why tape is sticky, and why we laugh. Kids can learn a lot from But Why because the questions are thought-provoking, asked by kids, and answered in a way they will understand. They’ll love to tune in because chances are your nieces and nephews have wondered similar things. If your niece or nephew has a question, help them submit one! In this fiction series, world-famous radio reporter and journalist Eleanor Amplified fights villains to find The Big Story for her show. Eleanor’s witty, quick, and daring personality will keep kids tuning in to discover how she will foil the next devious bad guy. This exciting and entertaining saga is sure to keep kids engaged and eagerly awaiting the next episode.